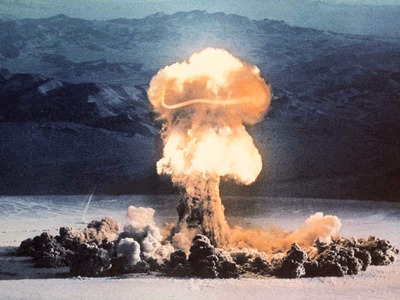 Nevada National Security Site/Wikipedia (public domain)‘Priscilla’ explodes with 37 kilotons’ worth of TNT energy at the Nevada Test Site on June 24, 1957. 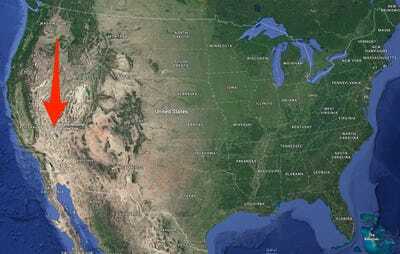 The US government detonated hundreds upon hundreds of above-ground nuclear explosions from 1945 to 1963 – right up until the first nuclear test-ban treaty was signed. The experiments tried out new bomb designs, measured their explosive power (called yield), verified that existing weapons still worked, and studied what might happen to anything and anyone unfortunate enough to be a target. About 10,000 videos of such tests were filmed, analysed, and locked away in high-security vaults, where they were nearly forgotten and began to decay. More than five decades later, however, a team of scientists at Lawrence Livermore National Laboratory (LLNL) is working feverishly to rescue, scan, and reanalyze the high-speed films. Over the past five years, Spriggs’ team has scanned some 6,500 films and reanalyzed them with modern digital tools for national security purposes. But as part of that work, the project has also declassified nearly 4,400 of the never-before-seen videos and uploaded about 500 of the clips to YouTube as of July 5, 2018. An additional 500 should go online within the next two years, after which the project will end, a LLNL spokesperson told Business Insider. “These films are priceless to us,” Spriggs previously told Business Insider. Here are some of the videos recorded in the remote deserts of Nevada and over the Pacific Ocean, with descriptions of what they show. This post has been updated with new information and video content. It was originally published on March 16, 2017. 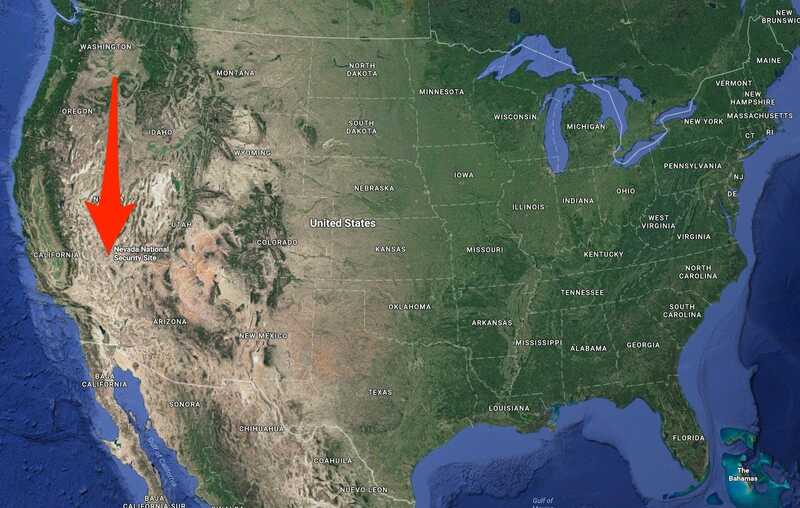 The US detonated more than 100 nuclear devices at the Pacific Proving Grounds. These blasts alone totaled about 210 megatons of explosive yield — and contaminated many islands and people with radioactive fallout. Google Earth; Business InsiderThe approximate location of the Pacific Proving Grounds nuclear blast testing site in the Marshall Islands. A “megaton” is a measure of energetic yield from a nuclear explosion, and it’s equivalent to 1 million tons of TNT being detonated. One megaton is equivalent to 1,000 kilotons – about 65 times the energy released by the weapon detonated over Hiroshima in 1945. Many of the films released by LLNL are of explosions over the ocean, like this high-altitude test from October 1962, and recorded at 2,400 frames per second — 100 times faster than a typical movie. A counter (bottom left) shows the number of frames elapsed after a detonation. Called “Housatonic,” the blast was one of 31 nuclear tests in Operation Dominic. 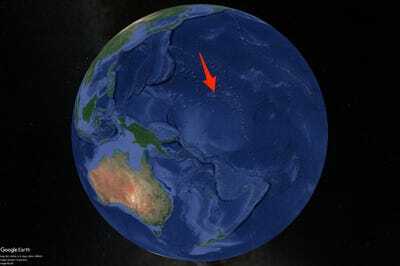 The device was detonated about 12,100 feet (3,700 meters) above the Johnston Atoll in the Pacific Ocean and yielded a blast of 8.3 megatons – more than 400 times as strong as either of the bombs dropped on Japan during World War II. Far off ground, nuclear blasts made fireballs that initially formed a perfect orb. Yet the updraft soon mushroomed each explosion. Shown here is “Harlem,” a 1.2-megaton blast from June 1962, which was also a part of Operation Dominic. When the blasts were big and low enough, their fireballs boiled the surface of the ocean and pounded the water with shockwaves moving at hundreds of miles per hour. This sped-up clip shows the “Bighorn” detonation – another Operation Dominic test – on June 27, 1962. During the operation, a 7.65-megaton weapon was dropped by a military bomber and detonated some 11,800 feet (3,600 meters) above the Pacific Ocean near Christmas Island. There’s so much moisture in Pacific air that large explosions — which temporarily drop air pressure — caused water to condense and become liquid droplets. Different humidity and air pressures at different altitudes sometimes created layered ring structures. Operation Hardtack I, conducted from April 28 to August 18, 1958, saw the detonation of 35 nuclear devices led by the military. “Juniper,” shown here, was a 65-kiloton blast set off on an ocean barge. This atomic blast film was recorded at a more standard speed to capture the evolution of a mushroom cloud over several minutes (though we’ve sped it up here). This cloud and its hundreds of tons of vaporized and irradiated coral reef eventually rose to about 40,000 feet (12,190 meters). Spriggs calls this condensation a “Wilson cloud effect, which obscures the fireball.” The phenomenon is named after Scottish physicist Charles Thomson Rees Wilson, who invented cloud chambers to study particles of radiation. The device exploded on June 10, 1958, and yielded about 215 kilotons of energy. Hundreds more nuclear devices were exploded and filmed at a desert location now called the Nevada National Security Site. In most cases, a metal tower was erected and held down with wires, then a nuclear weapon was placed on top. The structures raised bombs hundreds of feet off the ground. “Tesla,” shown here, was a relatively small blast of 7 kilotons, or less than half the yield of the bomb detonated over Hiroshima. In this colour film, a blast of thermal radiation — which accounts for the majority of energy released by a nuclear weapon — vaporizes tie-down wires as it travels outward. The “Sanford” test was detonated on October 26, 1958, during Operation Hardtack II in Nevada. The 4.9-kiloton device was exploded in part to test a warhead designed for submarine-launched missiles. The jets that shoot out of the fireball at the beginning of this clip are called “rope tricks,” named for the visual effect of vaporizing tie-down wires. Here’s another view of the “Sanford” test. Not all of the blasts were supposed to be big. This one yielded about 80 times less energy than the bomb that exploded over Hiroshima. “Rushmore” – part of Operation Hardtack II in October 1958 – blew up with a yield of only 188 tons’ worth of TNT dynamite. Smaller “tactical” nuclear weapons – which the American, Russian, and Pakistani militaries have developed but never used in battle – could have blasts like the one in this footage. Each film takes about four hours to analyse, Spriggs said. To estimate a yield, he measures the blast’s fast-moving shock wave in the footage, and compares it — frame-by-frame — to the expansion of the bright inner fireball. Operation Teapot’s “Turk” test blast was about 43 kilotons, or nearly three times greater than the Hiroshima blast. It was detonated 490 feet (150 meters) off the ground on March 7, 1955. More “rope tricks” are seen here as the test-blast tower is vaporized. When the blast’s shock wave reaches the ground, it inflicts catastrophic damage. The fireball then follows to incinerate just about anything in its path. After 1963, Russia, the US, and the UK agreed to move nuclear weapons testing underground. Operation Plumbbob’s detonation of “Rainier” on September 19, 1957 yielded only 1.7 kilotons. However, it was the first nuclear explosion ever to be fully contained underground and leak no radioactive fallout into the air. The shock wave could be detected around the world. At the lower left in this clip, you can see a giant boulder rolling down the hill at the Nevada National Security Site. Moving tests underground helped contain radioactive fallout, which can increase rates of cancer. However, many subterranean tests leaked contaminated dust and soil — some intentionally so to understand the dangers of fallout. The US conducted Operation Nougat, which included a total of 44 nuclear explosions, right after the Soviet Union did away with a legal moratorium on test blasts. “Danny Boy” was a very small (but nonetheless alarming) 0.430-kiloton nuclear explosion set off on March 2, 1962. It was meant to test devices called “atomic demolition munitions” – also known as nuclear landmines. You can watch all of LLNL’s newly declassified movies in LLNL’s YouTube playlist.